With interest rates threatening to squeeze the amount of disposable income in our pockets one of the first areas where the majority of us are likely to make spending cuts is the annual holiday allowance. Where at one time, two or three breaks was the norm, it may be that there is only room in the bank account for a single trip. Which means that for golfers who are married or partnered, there is a stark choice: opt for a non-sporting holiday or shop around for breaks that will keep your companion happy while you hit the course every day. The worst case scenario is one where your partner is left sulking in the hotel room or by the pool while you are enjoying 18 holes. You may return in time for an afternoon excursion and an evening out, but the chances are that the damage has already been done. On no account underestimate the power of the golf widow or widower to make your life hell as revenge for what they see as willful neglect in the name of playing golf. The most obvious way to avoid the problem is to travel with other members of your local club, the reason being that the presence of their partners will give your own a buddy or buddies to find an interesting diversion of their own. If it is just the two of you, then look at the packages on offer and the locations. Opting for a holiday village means that there will be other sporting activities on offer for those who don’t like golf. Centres close to the coast should be available to offer water sports such as wind surfing, while inland locations are likely to offer tennis courts along with coaching sessions, swimming facilities, or perhaps an introduction to horse riding. A well equipped spa is always a welcome addition, and contrary to popular belief they are not solely the preserve of female partners. A hire car can be invaluable, too, because it offers your partner a means of escape should they find a golfing centre or country club a little claustrophobic. Four wheels will also be welcome should there be a large town close by, because a morning’s shopping followed by a spot of people watching over a coffee and pastry is likely to soothe the brow of the more neglected holiday partner. Interesting historical sites and places of natural beauty will also provide a welcome diversion. The same rules apply if you have children. So look in the brochure for kids’ clubs and other supervised activities that will not only keep the young ones happy but also spare your partner the burden of having to monitor them for the three or four hours that you are away on the course. If your older children are beginning to catch the golf bug, too, then enquire about junior coaching facilities that will make the whole experience more inclusive. As long as the coach isn’t too good. You don’t want junior showing up mum or dad the first time that you go head to head on the tee. 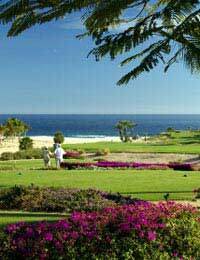 Ensuring that your partner and other family members are catered for will mean that you are free to concentrate on your golf in the knowledge that you won’t return to long faces and fractious tempers. And remember, if everyone has a good time, the better the chances are that you’ll be allowed to indulge your golfing passion on next year’s holiday.